Santa Claus waves to the crowd during the 92nd Macy's Thanksgiving Day Parade in Manhattan, New York, U.S., November 22, 2018. From VOA Learning English, I'm Caty Weaver. Today, Steve Ember and Shirley Griffith present a special program on Christmas traditions in the United States during the first half of the 19th century. During this period, there was no set way of celebrating the day, which was not yet an official holiday. Communities around the country honored the day in different ways. Some observed Christmas as an important Christian religious day honoring the birth of Jesus. Others celebrated the day with parties, music, drinking and eating. And, some communities did not celebrate the day at all. But, it was during this period that Americans began to reinvent the holiday. They combined ancient Christmas traditions from different cultures with modern American influences. Here are Steve Ember and Shirley Griffith. In 1819, the popular American writer Washington Irving wrote a series of five essays published in a book called The Sketchbook of Geoffrey Crayon, Gent. People watch the Christmas tree lighting at Rockefeller Center in the Manhattan borough of New York City, New York, U.S., November 28, 2018. Penne Restad wrote a book Christmas in America: A History. It shows how Americans began to slowly shape Christmas into a unifying national holiday during the first half of the 19th century. She describes how Christmas had different meanings for Americans who came from different cultural and religious backgrounds. Many immigrants brought Christmas traditions from their own countries. 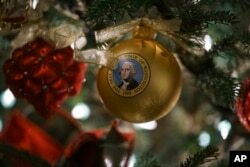 Americans already knew old Christmas songs that came from England and other areas of Europe. But many new American Christmas songs started to become popular. For example, in eighteen forty-nine, a religious leader from Massachusetts wrote the words to It Came Upon a Midnight Clear.The song Jingle Bells appeared seven years later. And, a year later, a religious leader in Williamsport, Pennsylvania wrote the song We Three Kings of Orient Are. This character is based on the story of Saint Nicholas, a Christian holy person believed to have lived in the third century. Saint Nicholas became known as a protector of children. Different cultures have given him different names. These include Sinterklaas, Kris Kringle and Father Christmas. But for most Americans his most popular name would become Santa Claus. In the 19th century, many Dutch immigrants living in the United States celebrated the feast of Saint Nicholas on December 6. Saint Nicholas was especially important to New Yorkers because of their history as a Dutch colony. In 1809, Washington Irving published his History of New York. It lists Saint Nicholas as the patron saint of New Yorkers. He describes the saint wearing a low hat, large pants, and smoking a pipe. Does this description sound familiar? 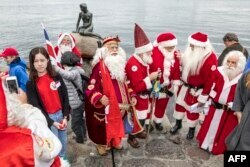 Participants of the Santa Claus World Congress visit the Little Mermaid statue in Copenhagen, Denmark.